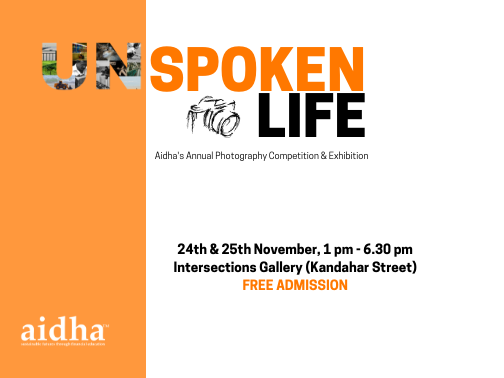 Discover hidden talents and take a unique perspective on the lives of foreign domestic workers (FDWs) in Singapore at the 3rd Annual Aidha Photography Exhibition from 24th to 25th November 2018. As a way to celebrate foreign domestic workers as dreamers, artists and changemakers, Unspoken Life gives voice to the journeys that FDWs take when they arrive in Singapore. There are over 240,000 FDWs in Singapore but many remain unseen and invisible, defined solely by their duties and responsibilities. This exhibition delves beneath the labels to unfurl the many selves that FDWs keep hidden from Singapore society. The featured photographs are all taken by FDWs as part of the Unspoken Life Photography Competition. Photographs will be available for sale and all proceeds will go towards the Aidha’s 2018 Gift of Education campaign. From the breathtaking photographs and inspiring stories to lively interactive workshops facilitated by foreign domestic workers, the exhibition is filled with fun and cultural activities for everyone! Also, don’t miss out on the screening of ‘The Helper’, an award-winning documentary showcasing the sacrifices and the lives of migrant domestic workers in Hong Kong which will take place on Sunday, 25th November, at 11am and 4pm. Click here to book your tickets. We are also partnering with the Singapore Committee for UN Women by taking our stand with them for #16DaysOfActivism, this exhibition being one of the featured events. The time for change is here and now! Stay tuned here for a full lineup of events in support of this global campaign. Come with your friends, helpers and families and join us for this exciting event!